Here is the episode 6 coverage, but I have to admit I'm losing interest. I object to several of the original choices in the All-Stars cast - perhaps more deserving designers said no - so the premise from the start has been flawed. As well, the challenges have many times not been designed to really show a designers skill, so who has been sent home was a real crap shoot. I want to warn you, the designer who goes home today should have been in the final based on his skill. The fact he was sent home this early in the competition - before even Kara - is a sign that something is flawed in this competition. Nevertheless, here is my take on it all. This week the inspiration was the seasons and some very short sighted exec decided it would be a face to face challenge. Each duo would have a winner and loser and the one sent home would be from the losers. That is sort of like putting the top seeds together early in the tournament while letting the bottom seeds to battle each other - totally flawed. Still, one would assume the judges would look at their body of work and talent in the final choice. This week's show is at the top of my list of times I disagreed with the judges. First - with no comment on who did what or the season I want you to pick a winner and a loser over all. Don't look at the caption noting designer or winner. Just give it a quick scan and decide what do you think is appealing or what would you wear? Which is top and which the bottom? I think that's the best start. Now for the shocker. The blue outfit in the bottom right photo went home. Yup. And guess what - it's Rami who has to be one of the top talents on this show all together. Not only did I think he won the face-off with a much more original offering (and I like Mila a lot, so a real statement), I definitely did not think he in any way shape or form should was the bottom of the pack. Of all the designs here, there were only a couple I liked and his was one. Overall my favourite was probably Jerrell's. He ended up the winner and deservedly so. For the TV drama this week they had Michael and Jerrell. I like Michael but I think he was in the wrong this time. He started with a totally different concept while Jerrell developed an over-size jacket. Jerrell's jacket was 3/4 finished when Michael decided to can his original design and create an oversized jacket. Absolutely not the same and it was appropriate for Winter, but the chain of events spoke for itself. If he had started on this oversize jacket from the start, no one would have blinked an eye. I'm very glad Jerrell won. I don't know what to say about this competition. There are several designers I love here, Rami, Mondo and Mila in particular. So far they sent one of the 3 home. I actually know what episode 7 holds and again disagree with the outcome. 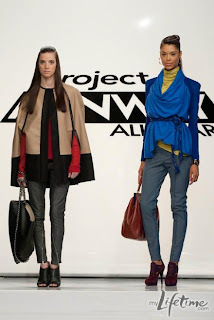 Add in the model host who is a lovely person, but has a terribly boring speaking voice and delivery and I wonder if this will ever go to a 2nd season. And I am not alone. If you check out other blogs there is an incredible dissatisfaction with this show over all. 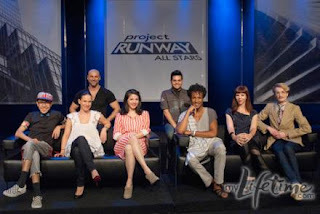 Unfortunate as I love the concept of Project Runway and have been a loyal fan from season one.